You’re spending 30% of your marketing budget on content marketing – but are you seeing the ROI you want? Are you producing enough? Or are there still holes in your editorial calendar? Get more bang for your buck – and exponentially more content – by repurposing. Hubspot’s review of more than 13,500 companies found that those that “published 16+ blog posts per month got almost 3.5x more traffic” than companies that published 4 or less posts. The same review also pinpointed a direct correlation between increased content production and increased traffic. In other words: the more content you have, the more traffic you get. Not that quantity is everything. Quality is equally important, and sacrificing quality in the name of quantity won’t yield the results you’d like to see. If, however, you can steadily produce high quality content, your audience (and Google) will view you as a valuable resource. So how can you do it? By repurposing. We’re all looking for ways to save time and money, and repurposing content does both for you: it’s the simplest way to create more quality content with less data, manpower, or other resources. Many marketers go wrong by mistaking repurposing for recycling. Repurposing is not reusing or resharing the same old piece of content. If you’re repurposing, you should be creating new content by presenting an existing idea or piece of information in a different way. Freshening up your old content, using existing content as a springboard for new content, or leveraging a central idea as the foundation for a collection of content can help you minimize the heavy lifting while yielding more traffic and engagement. Repurposing content helps you get the maximum return possible for each concept, topic, or data set. Leveraged correctly, one idea does not equal one blog post – it’s the framework for three or four. The same goes for a case study, an interview with a thought leader in your industry, or a few compelling statistics. Here are four methods of repurposing content that help your readership and your bottom line. 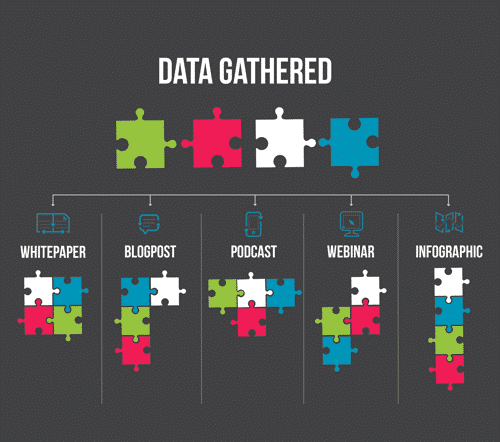 Switching up formats is an often overlooked way to produce more content. We tend to fall into a routine with our editorial calendars to cycle through the same types of content on the same schedule each month. But the rinse and repeat routine isn’t generating the maximum value add for each topic you cover. Instead of using your next great idea as the basis of a long-form blog post and then shelving it, use that idea as the foundation for a blog post, a whitepaper, an infographic, and a podcast episode. Yes, you’ll need to adjust your copy and graphics to suit each type of media, but you’ll be investing a lot less time than it would take you to develop four different ideas and oversee each one from conception to research and production to completion. Don’t miss out on content opportunities because you’re used to thinking within one familiar format. Try creating visual, audio, interactive, and written content to offer your audience a variety of options and test out new formats. While recycling is frowned upon, upcycling is not. Review the metrics for your existing content and devise ways to further capitalize on those that are performing well. Combine that popular series of blog posts into a single eguide that you use to capture more emails and build your lead database. Or get even more mileage out of a high-converting eguide by turning it into an online course – simply create some corresponding worksheets and videos, then break each section down into a lesson within the curriculum. And so on. You can apply this formula to almost any piece of content that’s been successful for you. Again, some legwork is required – but not as much as a brand new piece of content entails. If you give your user everything he needs in one convenient, bite-sized package with a bow on it, he’ll take it, thank you, and be on his merry way. Yes, you want to provide valuable, meaningful content for the user – but not so much that he doesn’t need you anymore. That’s why secret sauces remain secret: they keep us coming back. Don’t stuff every single bit of valuable information about your chosen topic into one piece of content. Pace yourself – and your user – by thoroughly covering a single aspect of the topic in one blog post, then leaving the rest for additional posts that tackle the topic from different angles. For example, discussions about the strategy, processes, skills, and resources required for a specific topic can all be broken up into separate pieces of content. This sets the groundwork for you to dive deeper into each aspect of the topic while also positioning you as a wealth of future information. Bridging several pieces of content also helps you build trust and loyalty with your audience. The more a user views you as a reliable resource, the easier it will be to keep him in the fold and usher him along the sales funnel until becoming a paying customer. Make the old new again by periodically updating your cornerstone content. Cornerstone content is integral to helping your user become familiar with your business and navigating the most crucial information on your website. This content is often what you start with – and, therefore, it’s often what becomes most outdated as your business grows, your focus shifts, or the industry changes. It’s important to check in with your cornerstone content periodically to make sure it’s still accurate, relevant, and – most importantly – focused on attracting your target market. In addition to updating copy or images, audit your site to at least once a year to add any necessary pages, eliminate pages that are no longer needed, or move pages around to maintain a balanced site structure. Keep in mind that your most popular blog posts, resource pages, or downloads are also considered cornerstone – so remember to keep those updated, too. Freshening up your cornerstone content is an easy way to give your site a small facelift while ensuring optimal UX. About HyperX: We’re the marketing experts. We’ve been leading the industry in marketing automation and content marketing since the internet first hit households. We’ve outlived all the other agencies because we’re the best at what we do. Contact us and start partnering with the best.